excellent work, mr home minister! – welcome! You are here: Home › Double standard › excellent work, mr home minister! excellent work, mr home minister! china press hauled up over IGP quit story. now, let’s see you do that to utusan malaysia one day. what utusan did was even far far more more worst – very racist, very seditious and yes really true lies too – but yet the home minister did not take any action at all on utusan, why not even a word of warning. 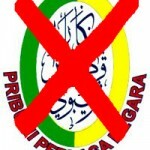 then china press published the IGP is going to quit when the IGP said no he is not going to quit – whoosh!! so fast, just hours later, the home minister, kerismuddin issue a show cause letter to china press. what? that ‘lie’ will cause unrest to the country? it was a small matter if compare to all those racist/seditious comments utusan spewed out. now that will surely cause unrest!! but we all know he (and the other umnoputera) are practising double standard, we are living in 2malaysia, hence no action against the umno-controlled utusan. 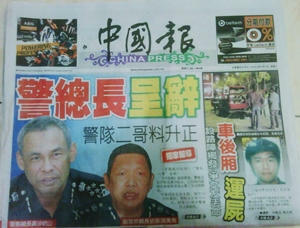 if china press really published the ‘lie’, it deserved to be reprimanded of course but we question why utusan was not. and this was only a ‘lie’ that IGP resigned, why kerismuddin take it so seriously as though it is a lie that the IGP had died… so much so to issue a show cause letter. i notice in comments here and there and some news portal, a few people said “there is no smoke without fire”. they think that for sure china press must have got this info from some source. someone also said that perhaps it is true the IGP is going to hand in his resignation but before he can hand it in to the home minister, word got out, hence the news from china press. 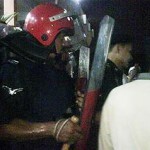 then kerismuddin was not happy so both he and the IGP quickly denied the news. oh well, whatever. what stand out most among the comments is that almost everybody wants to see the IGP resigned!! his name has been linked to underworld figures. he, together with the AG was said to fabricate evidence against anwar ibrahim (but the court cleared him. of course. it’s umno court). he was said to have some trump card against the PM. all these – people were angry and do not wish him to be our police chief of the country!! GO MAKE US HAPPY, RESIGN, MUSA!! 2 Responses to "excellent work, mr home minister!" Rosie now can sing another thousand mandarin songs with her company and that will never win over the Chinese. Brilliant Kerismuddin has shot her in the foot! Anyway, the song was for the MCA ppl only.